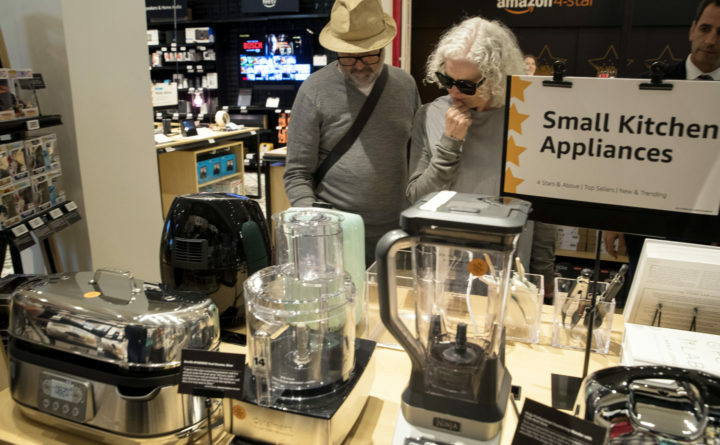 Shoppers browse the items on display at the Amazon 4-star store in the Soho neighborhood of New York, Sept. 27, 2018. On Tuesday, the Conference Board releases its October index on U.S. consumer confidence. The results, coming amid a rout in U.S. stocks, bode well for continued gains in consumer spending, which accelerated in the third quarter to the best pace since 2014. A solid job market is helping to support household confidence as well as Americans’ purchases, which account for about 70 percent of the economy. The figures add to signs of contentment with the economy ahead of next week’s U.S. midterm elections that will decide control of both chambers of Congress. Bloomberg writer Kristy Scheuble contributed to this report.